STV made legal history as the first broadcaster to film in court during sentencing of David Gilroy. Two-thirds of Scottish lawyers have backed the use of television cameras in the courtroom. A poll reveals widespread support for allowing TV crews to film and broadcast court proceedings. The issue has become one for public debate after STV was granted permission to film the sentencing of murderer David Gilroy, in a legal first. Cameras were allowed to film as Lord Bracadale sentenced Gilroy to life in prison for the murder of Suzanne Pilley, at the High Court in Edinburgh earlier this month. Nearly 600 lawyers, advocates and academics responded to the poll, by Scottish Legal News, which asked "Do you believe TV cameras should be allowed into courts?" Of the 565 responses received, 367 - or 65% - said "Yes". 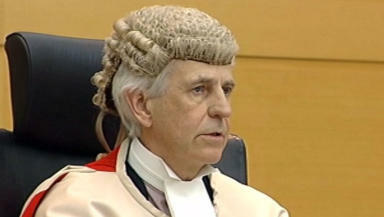 Brian McConnachie QC, vice-chairman of the Faculty of Advocates Criminal Bar Association, said: ""My position is, with some reservations, that it would be a good thing to have greater media access to the courts, principally on the basis that it would provide the general public more information about how the judicial system works. "At the moment people’s knowledge of what goes on in court is influenced by what they see on television and I think if the public could see what goes in real life cases it would provide them with a proper understanding of how the courts work and the work that goes on in preparing cases. "After all, courts are public buildings and vast majority of cases are public places."